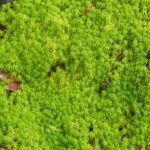 Why do I have clumps of moss in my flower beds? What causes thick clumps of moss to form on the soil in my flower beds? Should I leave them or remove them?